Let’s write and use a formula to find the area of a triangle. 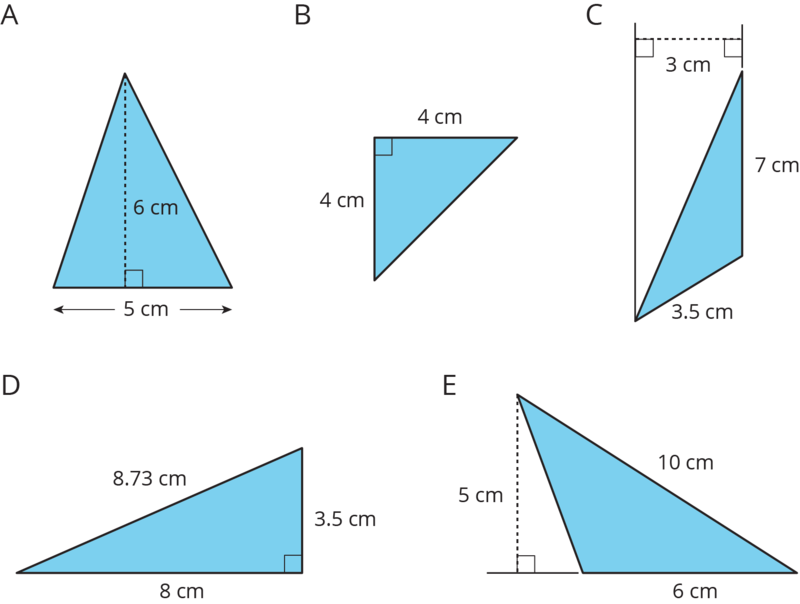 Study the examples and non-examples of bases and heights in a triangle. Answer the questions that follow. 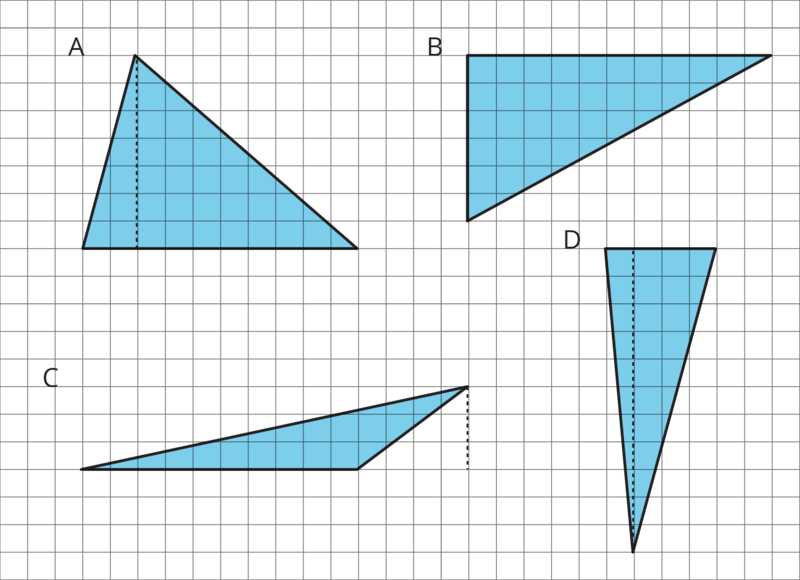 These dashed segments represent heights of the triangle. These dashed segments do not represent heights of the triangle. Select all the statements that are true about bases and heights in a triangle. Any side of a triangle can be a base. There is only one possible height. A height is always one of the sides of a triangle. 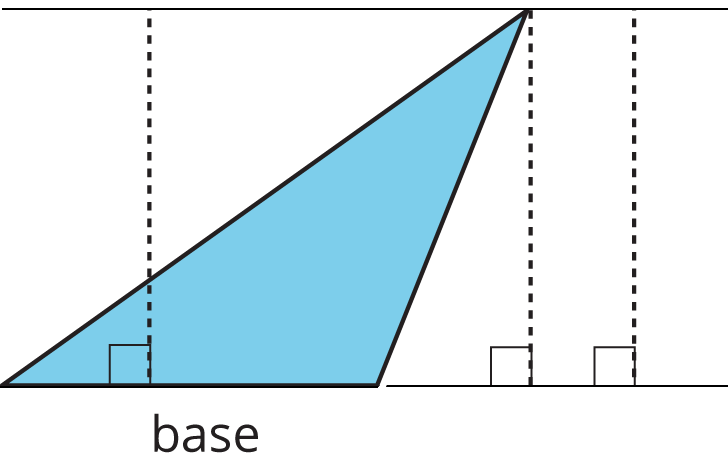 A height that corresponds to a base must be drawn at an acute angle to the base. A height that corresponds to a base must be drawn at a right angle to the base. Once we choose a base, there is only one segment that represents the corresponding height. A segment representing a height must go through a vertex. For each triangle, label a side that can be used as the base and a segment showing its corresponding height. In the last row, write an expression for the area of any triangle using $b$ and $h$. For each triangle, circle a base measurement that you can use to find the area of the triangle. Then, find the area of any three triangles. Show your reasoning. We can choose any of the three sides of a triangle to call the base. The term “base” refers to both the side and its length (the measurement). 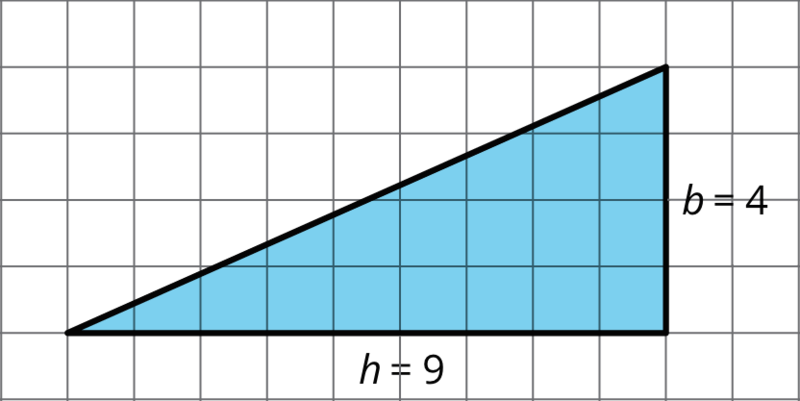 The corresponding height is the length of a perpendicular segment from the base to the vertex opposite of it. The opposite vertex is the vertex that is not an endpoint of the base. Here are three pairs of bases and heights for the same triangle. The dashed segments in the diagrams represent heights. A segment showing a height must be drawn at a right angle to the base, but it can be drawn in more than one place. It does not have to go through the opposite vertex, as long as it connects the base and a line that is parallel to the base and goes through the opposite vertex, as shown here. The base-height pairs in a triangle are closely related to those in a parallelogram. Recall that two copies of a triangle can be composed into one or more parallelograms. Each parallelogram shares at least one base with the triangle. For any base that they share, the corresponding height is also shared, as shown by the dashed segments. We can use the base-height measurements and our knowledge of parallelograms to find the area of any triangle. The formula for the area of a parallelogram with base $b$ and height $h$ is $b \boldcdot h$. The area of Triangle A is 15 square units because $\frac12 \boldcdot 5 \boldcdot 6=15$. The area of Triangle B is 4.5 square units because $\frac12 \boldcdot 3 \boldcdot 3 = 4.5$. The area of Triangle C is 24 square units because $\frac12 \boldcdot 12 \boldcdot 4 = 24$. In each case, one side of the triangle is the base but neither of the other sides is the height. This is because the angle between them is not a right angle. In right triangles, however, the two sides that are perpendicular can be a base and a height. The area of this triangle is 18 square units whether we use 4 units or 9 units for the base. When you choose a side to be the base in a triangle, the vertex that is not an endpoint of the base is the opposite vertex. Any of the three sides of a triangle can be chosen as a base. The term base can also refer to the length of this side. Once we have chosen a base, the corresponding height is the length of a perpendicular segment from the base to the vertex opposite it. The opposite vertex is the vertex that is not an endpoint of the base.